If you do not have enough experience to run your own yacht or frankly you just prefer to relax and let someone else take the strain why not book one of our yachts with a professional skipper. Skippered charter is especially good for those families with small children or for charterers who just want that extra bit of assurance that an extra pair of hands brings. By using the services of one of our well qualified professional skippers you can just sit back and relax on your yacht charter whilst visiting all the best harbours and anchorages. We can advise you which sailing yacht would be most suitable for you & your friends. With your skipper we can plan a route and he will take you wherever you’d like to sail! You, your friends or your family can join in as much or as little as you like – it is a great activity holiday for all the family. If sipping a G&T while sunbathing is more your thing then you can leave it totally up to the skipper to do all the work whilst you relax. Every night you will be in another port or bay with restaurant facilities and during the day you can sail to another location or just anchor and swim. Your skipper will have the local knowledge to ensure you get the most from your sailing holiday, taking you to the best places and giving you lots of information about Turkey, our sailing area and its history. Alternatively Skippered Instruction is available; let our professional skipper show you the art of sailboat sailing at your own pace without the pressure of trying to achieve a qualification allowing you and your crew the opportunity to learn to sail whilst enjoying a stress free holiday. Sail in Turkey has always offered Bespoke Own Yacht Sail Training Courses for those that would prefer to learn to sail on a one to one basis with a qualified Skipper aboard a yacht which suits your needs with regards to size, accommodation, duration along with the right amount of practical and theory tuition you require. With Sail in Turkey you have the flexibility to determine your exact needs. Let us know what your expectations and requirements are and we will put a package together accordingly. For example you may wish to have an exclusive Sail Training package whereas it is just you sailing the yacht with a Skipper who will give you 100% of his time during your charter or perhaps one or two of your friends or family will join you. New for 2018 we are happy to announce that we are now working with Colin Jaquiss, RYA School Principle and Chief Instructor. Colin grew up sailing dinghies with his family in North Wales. After a successful career in training & development Colin has been a professional yachtsman since 2006. 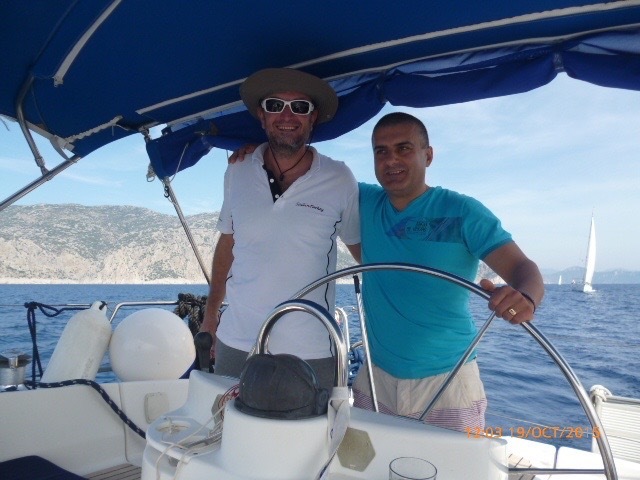 He became an RYA Yachtmaster Instructor in 2008 and has over 10 years of experience of teaching RYA courses to students of all nationalities, abilities and levels. Compare the yachts in our fleet & choose which yacht suits you, your friends & family. You can check availability & charter price on-line. The quote will be for the yacht only & will not include the skipper fee so you can compare prices directly. The skipper fee is an additional £120 (GBP) per day (£840 (GBP) per week). The charterer must provide a berth for the skipper on board & is responsible for food & beverages during the charter.